Quickly throw together a wholesome weeknight meal using up any leftover turkey you might have on hand. This turkey and noodle casserole is comforting, and a perfect way to transform that leftover turkey into a whole new meal. 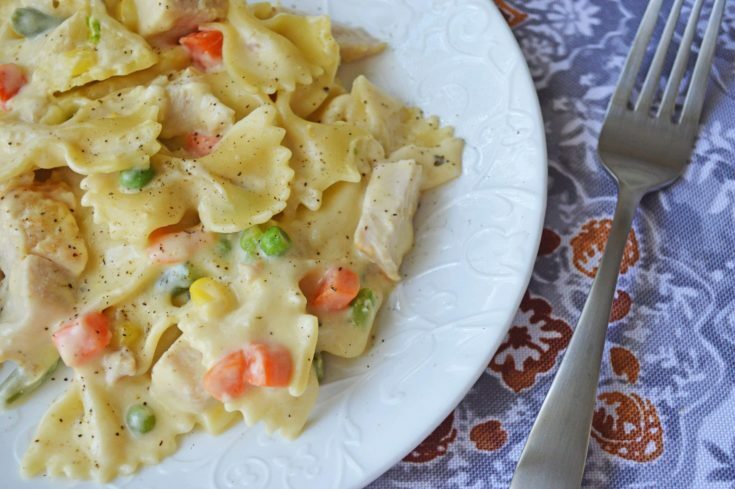 Tender pasta, a creamy sauce, juicy chicken, and mixed vegetables in every bite. 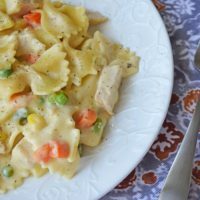 This Turkey & Noodle Casserole is so delicious and so easy to make it is my number one after the holidays’ survival tool. Every year I host either Thanksgiving or Christmas dinner. I love the holidays and love all of the planning, the cooking, the taste testing and family time. What my kids and husband do not love about our hosting a holiday, is the boring leftovers. I live in a household of people that do not LOVE leftovers! I have no idea how this happened, but my solution is to get a little creative with our leftovers. I love to take my leftover turkey and make this easy and delicious Turkey & Noodle Casserole. For other delicious Turkey, recipes check out these Simple Turkey Leftovers Recipes. One question I have been asked is can you make this with fresh turkey? Yes, just cook your chicken how you planned to and then shred the chicken and use it in this noodle casserole. The sauce is condensed soup to help speed up your prep time even more. Add in your ingredients, mix well, and bake to bubbly perfection. Now, we use frozen vegetables because they are easy, and they keep their tender flavor once they get baked, and don’t end up mushy. Don’t like green beans, then leave them out. The beauty of this casserole is the versatility of it. You can swap and omit ingredients you don’t like. Sometimes we even add in canned mushrooms, it is truly finding what you have on hand and make it work. Or you can skip the vegetables altogether if you are not a fan. Or if you have leftover chicken use that in replace to the turkey. It will taste just as good! There are no set rules for this recipe. Turkey is a great protein to reach for when cooking. I don’t box turkey into the holiday season, I love making it year round. Here are a few health benefits you will gain from eating turkey. Turkey is loaded with protein, which is lean. For around 4 ounces of turkey, it will have around 32 grams of protein. Also, turkey has a lower saturated fat so it can be a good option for people who are looking at watching saturated fat in their meals. You will also gain nutrients from that slice of turkey. From Vitamin B and niacin, they will help give your body a boost. B6 is great for maintaining a steady blood sugar level, which is great for diabetics. As you can see turkey is a good protein to serve up anytime of the year. I love to use up all of our leftover turkey at the holidays in fun ways like this casserole. But, I also love a wholesome turkey sandwhich with a layer of cranberry slathered on the bread. Give this recipe a try and let me know what you guys think. If you are a fan of creamy based casseroles I totally think this recipe will be right up your alley! 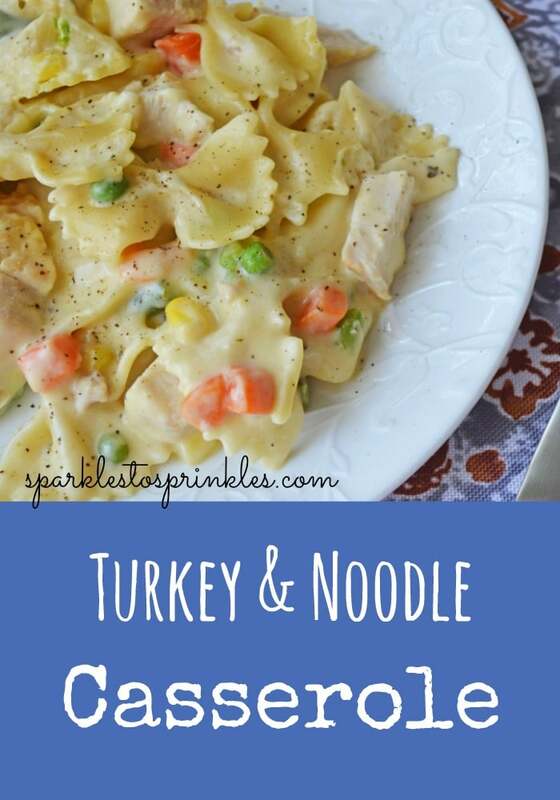 Delicious and easy Turkey & Noodle Casserole, perfect for holiday leftovers. Most of the ingredients are right in your pantry for this amazing recipe. Preheat your oven to 350 degrees. Spray a 9x13 pan with non-stick cooking spray, set aside. Meanwhile, in a large skillet, add ¼ cup of butter and heat over medium heat, until melted. Add frozen vegetables, and cook until just thawed. Add 6 tbsp flour and mix well. Cook 1-2 minutes. Stir in milk, and bring mixture to a boil. Cook 4-5 minutes over medium heat, stirring frequently, until thickened. Add cooked turkey, cream of chicken soups, sour cream, and salt and pepper (to taste, I prefer to be generous, this makes a big dish). Mix until well combined. Add in cooked, drained pasta, and stir to combine.